The day before I was to leave on holiday my allotment neighbour, Carol, called and left a message asking if I knew my shed had burnt down. And this is what greeted me when I drove down next morning. Immediately I could think of all sorts of gross and heinous punishments for those that did it. First beat them to an inch of their lives, then a public disemboweling with blunt secateurs, maybe some boarding in comfrey tea to make them see the error of their ways followed by a light spot of weeding clearing the entire allotment site of stinging neetles using their teeth by way of redemptive community service. No doubt I was reacting in the usual way of all victims - a sense of violation, followed by anger and the desire for revenge. Anyway I reported it to the police (I didn't expect much but was very impressed with their response and an officer came to visit the site later that day) and a fire service investigator came also, both interested in logging the incident to see if there is any pattern in the area. What I did learn is it's very unlikely, almost impossible, that the lawn mower stored in the shed would have self combusted. Even filled with petrol there wouldn't have been enough oxygen in the tank and the heat would have had to have been intense and 'just right' to set it off. Ignition by persons unknown is what's going down in the official report and I'm now the proud owner of a 'C' number on which my insurance company will pay up - er, that's if I had any insurance. 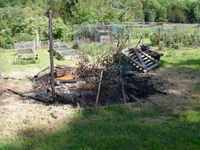 The Pilgrim Rose climbing up the shed side is charred but I'll see if it grows back - perhaps the roots weren't fried. The lawn mower is a burnt out shell and all the tools are gone, including my father's, which though I seldom used were always a reminder. The good thing is that the growing area, protected by netting and a wooden cage escaped unharmed. So we've had a set back and the allotment for the time being doesn't seem the bucolic place it was, but we are still growing. Still, keep the right attitude. Cup of tea anyone? Cup of tea? Large whisky! A pox on them, I say. That's a real shame, such a waste. Sorry to hear you lost your Father's tools and the rest, good thing the garden wasn't touched. If it had been my shed, the fire would have been spectacular since I keep several 5 gallon gasoline cans in there. That's really a shame. What kind of a person would do something like that! What a waste. You said before your only source of water was off the roof of buildings, so I guess you have less water now too. ---Patrick, even less as two water butts went up in smoke as well! Your shed and the Cutty Sark. -----Frankie, didn't think of that - good company! That is so terrible! How devastating that is. I am really sorry someone burned your shed down. Try not to think of it too much while you are on your holiday. Not that there really is a bright side, but at least you can put the ashes and cinders into compost and your shed will continue to work for you-just in another way. What an absolute shame !!! But...I have always found that what goes around, comes around. They'll get their come-uppance in time. Bastards indeed. I'm really sorry to hear about this, John. Unfortunately it seems to have happened to quite a few people I know and sadly there are a lot of ignorant blighters out there with so little decency and imagination they only know how to amuse themselves by wrecking the hard work of others. Insurance can't replace your father's tools anyway. I don't suppose there's a hope in hell of catching the buggers, but they should be put in the stocks and pelted with rotten vegetables. God, that makes me angry. That's so rubbish, especially when you stored things with so much sentimental value to them. Hope you had a nice holiday though. ---Thanks mildew. Just realised another tool is gone - my asparagus knife! Bummer. Holiday great, didn't think of the F...*&*&^...S who did it at all!!! As a fellow recent fire victim you have my sympathy. That's a horrid thing to happen. ---Hello Luke. Thanks. Well I'm thankful it wasn't my house.